Indian-Americans Amit Sheth, Gaurav Sukhatme, and Dinesh Manocha are among the eight honorees chosen by the Association for the Advancement of Artificial Intelligence as its 2018 Fellows. The AAAI recognizes a group of individuals annually for significant and sustained contribution in the field of artificial intelligence through its Fellows program. These Fellows are recognized as having an unusual distinction in the profession, according to the AAAI website. Usually, only members who have made contributions to the field for a decade or more will be selected in any year. A Fellow may be recognized for individual technical contributions or for having performed significant extended service for the AAAI, the website stated. Sukhatme from the University of Southern California’s School of Engineering’s Department of Computer Science has a special interest in multi-robot systems and sensor/actuator networks. He founded the Robotics Research Lab and the Robotic Embedded Systems Lab in 2000. Manocha is Phi Delta Theta/Matthew Mason Distinguished Professor of Computer Science at the University of North Carolina at Chapel Hill. He has co-authored more than 420 papers in the leading conferences and journals on computer graphics, robotics, and scientific computing. AAAI’s other Fellows are Nancy Amato, Regina Barzilay, Marie desJardins, Kevin Leyton-Brown and Joelle Pineau. The association will celebrate the elected Fellows in an event in New Orleans on February 4. Chintu Patel and Chirag Patel, Co-Chairmen of Amneal Pharmaceuticals, were honored as Persons of the Year 2017 for their monumental corporate success and philanthropy by The South Asian Times at a gala reception in New York on January 13. Consul General Sandeep Chakravorty, Congressman Steve Israel, and Suffolk County Executive Steve Bellone felicitated the duo. 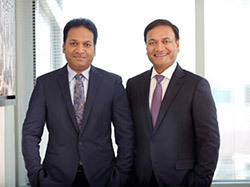 The Patel brothers have taken their company from being a small family business to the 5th largest generics drug company in the USA with $2 billion revenue expected in 2018. The company has touched these heights in 15 years. The brothers are also known for their charity work and have established the Niswarth and Irada family foundations with most of its projects being done in India. Chintu and Chirag featured in the cover story in The South Times New Year Special issue of January 6-19. Entrepreneurs, publishers, officials, and several community leaders from the Indian-American community were present to cheer the Patel brothers. Notable among them were Padma Shri Dr Dattatreyudu Nori and Dr Sudhir Parikh. Chirag Patel spoke about the infinite human potential, talking about “business success, and a greater purpose in life.” “We are not stopping, we have multiple projects in biotechnology,” he said about the growth of Amneal. Chintu Patel said their 75-year-old father, Kanu Patel, is their inspiration. He also thanked his team at Amneal. Prominent Indian-American lawyer Gurbir S. Grewal has become the first Sikh attorney general of New Jersey after he was unanimously approved by the State Senate. The 44-year-old was nominated in December. Grewal’s nomination was approved with a vote of 29-0. He was later sworn in at a private ceremony. The lawyer, a Democrat was Bergen County’s top law enforcement official who was appointed by Governor Chris Christie in 2016. He also worked at the US Attorney’s office as the chief of economic crimes unit. In his capacity as attorney general of NJ, Grewal will step up efforts to stem the opioid crisis and improve relationships between police and the communities. He will also see to it that the 21 counties develop a better response to the heroin epidemic. “I never imagined that my life’s journey could bring me here today. I’m extremely humbled, and I’m looking forward to getting started,” said Grewal. He was speaking during his confirmation hearing before the Senate Judiciary Committee on January 16. He added that after taking charge of his office he would introduce himself and get started with the job in hand. Some of his works include combating opioid abuse by bringing together hospitalized or arrested suspects with addiction counselors. This apart, Grewal’s focus has always been to improve the relationship between police and the community. 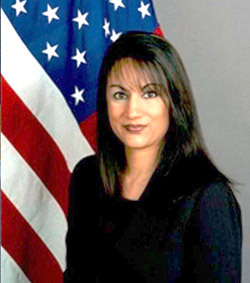 Manisha Singh, a prominent Indian-American lawyer, has become the first woman to be appointed as the Assistant Secretary of State for Economic and Business Affairs. The 45-year-old lawyer who hails from Uttar Pradesh was sworn into a key administration position in the State Department on January 20. 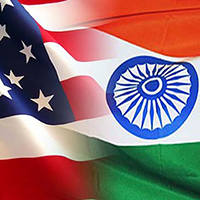 Singh who is presently the highest-ranking Indian-American official in the State Department was sworn in by the Secretary of State Rex Tillerson. “My honor and privilege to be sworn in by Secretary Tillerson,” Singh tweeted. She previously served as chief counsel and senior advisor to US Senator from Alaska Dan Sullivan. The latter was a former assistant secretary in the Bureau of Economic, Energy and Business Affairs. She also has vast experience in the private sector that includes practicing law at multinational law firms and working in-house at an investment bank. The attorney has the license to practice law in Florida, Pennsylvania and the District of Columbia. She previously worked as the deputy assistant secretary in the Bureau of Economic, Energy and Business Affairs. Indian-American, Sri Preston Kulkarni has announced plans to run for the 2018 US Congressional elections. The 39-year-old is seeking Democratic Party nomination for the 22nd Congressional district against Republican Congressman Pete Olson. Sri will run the elections from Texas. The 22nd district has southeast Texas and includes the cities of Sugar Land, Missouri City, Deer Park, Pearland and Galveston. Sri was raised in Houston by his parents, Margaret and Venkatesh Kulkarni, a novelist. Venkatesh Kulkarni came from India to the US where he met his wife. The family moved to Houston in 1980. 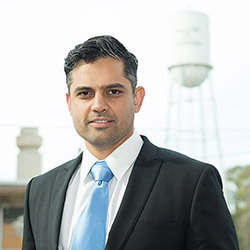 Sri who graduated from the University of Texas became a Foreign Service Officer and served his country for 14 years during which he toured Iraq, Israel, Russia, Taiwan, and Jamaica. Sri accepted a Pearson Fellowship to serve as a foreign policy and defence adviser on Capitol Hill in 2015. He assisted Senator Kirsten Gillibrand with her work on the Senate Armed Services Committee. “The greatest danger to our country right now is not a foreign power, but the internal divisions in our society. That is why I am coming home to Texas to serve,” Sri said. The 2018 primary election will be held on March 6, with the general election following on November 6.